Discussion in 'Full Las Vegas Trip Reports' started by aprilroncincy, Apr 11, 2019. DRPinVa, Jimmy2Times, Wiscolovesvegas and 4 others like this. DRPinVa, Spock, RobbieW and 7 others like this. I think I might like concerts at the Park! OMG sooooo full. We’re rolling out of the Sterling Buffet, but didn’t do it justice. It’s hard to eat that much! Everything we tried was great quality. A Bloody Mary bar was also included. We special ordered a cheese blintz and vanilla ice cream. Included! OMG, Those lobsters and king crabs looks so Delicious, I never thought I would consider paying that much on a buffet, maybe I would consider using the 2 diamond celebration certificates to go to Sterling just once. I love lobster and king crab legs, but my hubby might not get his money worth. I guess we would have to go to Vegas on a Sat. and have to get up early on Sunday too in order to go to the Sterling buffet Thanks for the pictures. I love them. Texas Steph, MNSlotLover and aprilroncincy like this. OMG, Those lobsters and king crabs looks so Delicious, I never thought I would consider paying that much on a buffet, maybe I would consider using the 2 diamond celebration certificates to go to Sterling just once. I love lobster and king crab legs, but my hubby might not get his money worth. I guess we would have to go on a Sat. to go to sterling buffet and have to get up early on Sunday too I suppose. Thanks for the pictures. I love them. It’s only open on Sundays and you need to make a reservation at least 2 months in advance. We didn’t eat enough to make it worth $125/each, but definitely worth it using our certificates. But if you can drink a lot of champagne and Bloody Mary’s along with lots of lobster, crab and steak, then worth it. The quality was like ordering at a nice restaurant. DRPinVa, tringlomane, Texas Steph and 1 other person like this. One more set of Golden Knight pics. I can’t tell you how much we enjoyed this! They really know how to treat their fans! We went inside by the Center Bar at NYNY to watch the parade. Like @tringlomane said, it goes through the casino and then outside my Nine Fine Irishmen. We, along with others, followed right behind them. The energy and cheering is contagious! 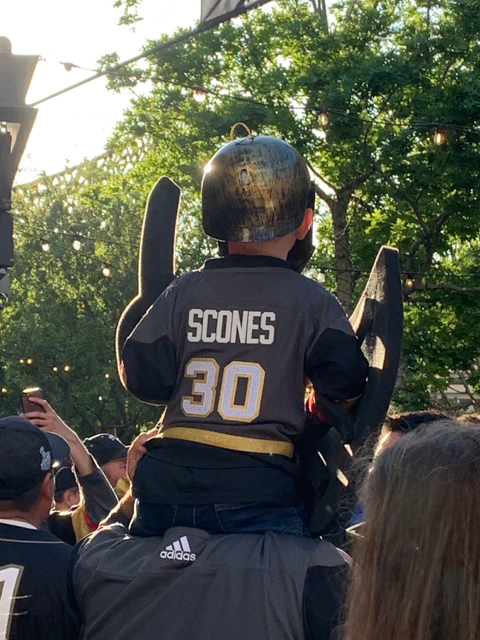 The crowds of people cheer and chant Go Knights Go as the parade winds down The Park. It then goes onto a float when it reaches TMobile Arena and the Knight does chants to the fans. Afterwards the whole group goes on the stage and the knight does more chants and then the cheerleaders dance. They then invite you inside the arena to the game or ask you to cheer them on from outside. DRPinVa, Spock, Jimmy2Times and 9 others like this. Yeah, we need to drive to Vegas on Sat. and get up early Sunday in order be able to go to sterling buffet, but I didn't know that it takes 2 months to make a reservation, thanks for letting me know. I think I can eat enough lobster and crab legs, but we are not much of drinkers, maybe one champagne for me and 2 max for my husband, I guess I need to talk to my husband to see if he think it is worth it. I suppose I can order king crab legs and lobster somewhere else for $250 too. Anyway, now I really want to eat the king crab legs and lobster seeing those pictures, look so Delicious. Thanks for posting them. The parade and VGN atmosphere looks so much fun. I can feel the excitement!! TR888, MNSlotLover, aprilroncincy and 1 other person like this. Good morning! 6:10am, so much for sleeping in. Yes, I’ll definitely take pics of Sterling Brunch. We’ll probably play on our free play this morning and then take our time getting to Bally’s. So yesterday we received an email inviting us to Beau Rivage for 4 nights during Memorial Day weekend. I would only miss 2 days of work. We’ve never been to Biloxi before, so decided why not? Flights, room $50FP all included for $99/each. Has anyone else done this? The best part of Beau Rivage is the waffle house right across the street. The hotel is nice, rooms are clean, hard rock is right next door and NOLA is an hour and a half drive. Plus you're in the south where were all as sweet as lemonade! We’ve been watching the game at Hussong’s, chatting with our favorite bartenders again. 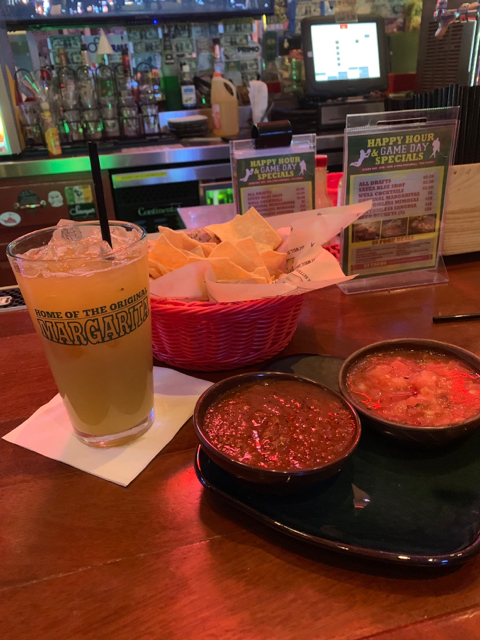 They have $6 margaritas and $5 snacks for happy hour and game days. Chips and salsa are free. The first period we had potato skins w/chorizo, but forgot to take a picture. Tasty and cooked perfectly. The second period we had carnitas sliders. Excellent! DRPinVa, Spock, Pleasemum and 5 others like this. Sounds like I know where we’ll eat breakfast! I have to agree southerners are friendlier in general! Spivderman, 7OutLineAway, Texas Steph and 2 others like this. We played a little more after the game, but no luck, so went up to the room. No sense in chasing. Up $407 after 3 days! We plan to only play on $200 each tomorrow, which is less than our planned bankroll for the trip, but that will effectively stop any loss. If we’re doing very well, then maybe play on more. See how it goes. DRPinVa, Spock, MissL7777 and 6 others like this. Great pics from outside the arena! Knights played very well last night! Looks like a great time so far! DRPinVa, aprilroncincy, TR888 and 2 others like this. We’ve done the Beau charters many times over the past 20 years. (We live in Tampa so it’s just an hour+ flight). If you like baseball, the Biloxi Shuckers play in the MGM stadium across the street. The Beau is running a fun promotion now through Memorial Day called Scratch It Rich. Nice pool area on the Gulf of Mexico. There are 8 casinos in the immediate area. You can take the casino shuttle or Uber/taxi if you want to visit more than just the Beau. Hard Rock is a short walk next door. The Beau is by far the nicest, IMO, but it’s still fun to explore other properties. Be happy to answer any questions. The only negative is you earn less Tier credits on your play than Vegas. Spock, aprilroncincy, TR888 and 2 others like this. Great TR as usual. AND a 2-1 Knights series lead is all good IMO. The atmosphere before a hockey game is AWESOME and actually gets dialed up a few notches during the playoffs. Pretty awesome! tringlomane, aprilroncincy, TR888 and 1 other person like this. I thought you might like to know what happened after the parade went outside! Texas Steph, tringlomane and TR888 like this. Thank you! Yes, we saw the baseball team is in town one of the nights, so plan to go. I definitely want to see the other casinos. Sounds kind of like Tunica. We really appreciate all the info from everyone who’s done this! DRPinVa, Texas Steph, kleland69 and 1 other person like this. It’s so much fun here! People are very excited. We are learning about hockey since neither of us grew up with it. We will buy tickets to a regular game next season. Go Knights Go! Texas Steph, tringlomane, RM777 and 3 others like this. Good morning! Enjoying breakfast at the Seabreeze Cafe at MB. Using a MyVEGAS reward for BOGO. The cafe looks out onto the pool complex. Windy today. I ordered sweet potato pancakes w/bananas foster. Ron ordered caramel apple stuffed French toast. Both were very good. What’s not to like?! DRPinVa, MissL7777, sparkydog and 4 others like this. eastcoastmitch, Mar 30, 2019, in forum: Come in and Introduce Yourself. We don't bite! Protagoras, Mar 28, 2019, in forum: Come in and Introduce Yourself. We don't bite! Haynesdad, Mar 21, 2019, in forum: Come in and Introduce Yourself. We don't bite! sav19, Feb 20, 2019, in forum: Come in and Introduce Yourself. We don't bite!